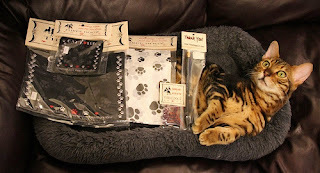 Deb Larocque from Three Dogz has kindly given me some great goodies to review and give to one lucky winner! Three Dogz is Upscale apparel for Cat, Dog and Horse lovers. "All of THREE DOGZ™ products and apparel designs are original, eye-catching, touched by classic styling, with fashion forward appeal." To enter this giveaway, please 'like' Three Dogz on their Facebook page AS WELL AS leaving a comment here on my blog, with your email! Paw print tissue paper, cat lover mouse pad, cat lover coaster, cat lover pencil and cat and dog shaped paper clips. Deb kindly gave me a set of the gifts to give away and I couldn't be any more happy with the products! 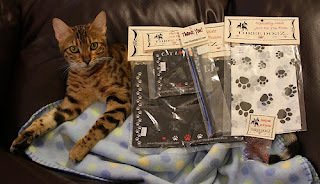 The tissue paper will be great to wrap presents in for all the animal lovers on my gift list. The coaster is on my nightstand, protecting it from the water bottles I bring upstairs every night. The mouse pad is fun to use when I am working on my blog. The pencil and paper clips are great for school or work, everyone loves my cat related accessories. This giveaway will run from Saturday November 26 to Saturday December 3 until 8 pm EST. Only accepting entries from the United States. Winners will be contacted via email and will be given 48 hours to respond or a new winner will be chosen. I will use random.org to choose my winners. Thanks for entering, remember to put down your email & good luck! Note: I was not paid or compensated for this review. I did receive these products free of charge to keep. The opinions of this review are solely mine. 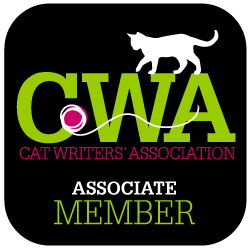 This past weekend I attended the 18th annual Cat Writers' Association Conference in White Plains, New York. The getting there wasn't easy, but it was a blast to meet my fellow bloggy buddies who have helped me so much in the last few months. I got to connect with so many fellow bloggers. 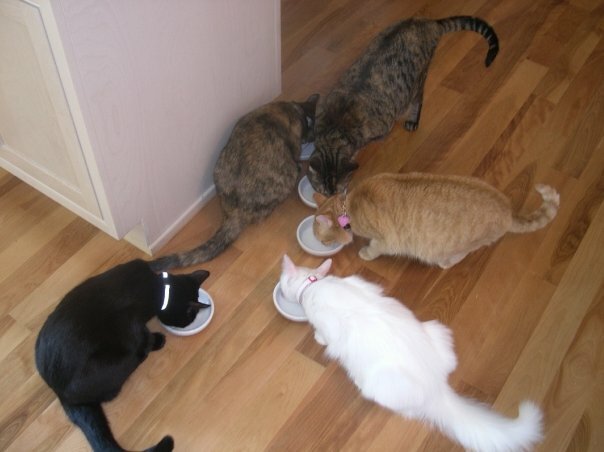 My new friend Layla Morgan Wilde from Cat Wisdom 101 featured a picture of the cat ladies (including me) having lunch whic you can see here: here. I also enjoyed getting the most pawsome swag bag and attending the Westchester Cat Show! Here are some pictures to capture the highlights of my trip. 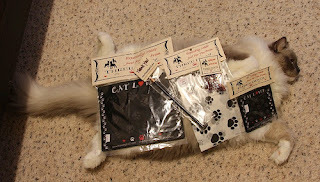 Awesome swag bag including a litter scoop, tons of cat toys, treats, food, a Bissell Stomp Pad, a calendar and many other useful cat related things! Lenny, a purple lilac British Short hair 4-month-old kitten at the Westchester Cat Show. 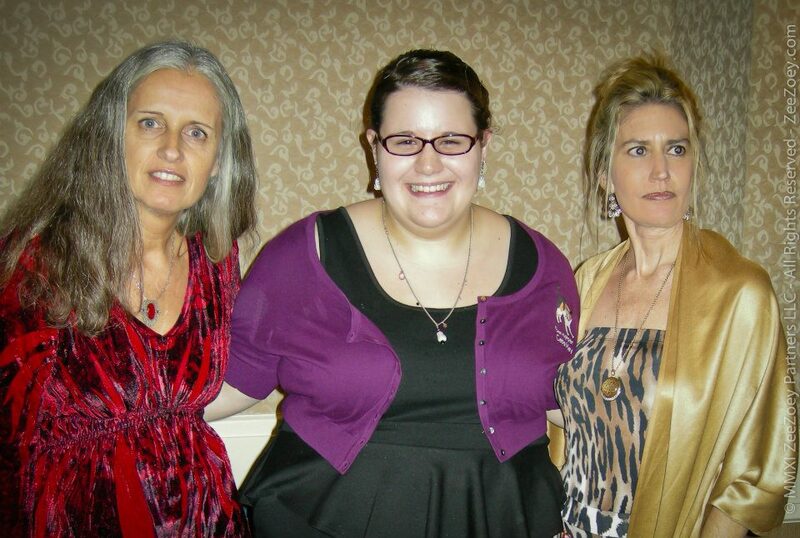 Hanging with Ingrid of Conscious Cat (left) and Deb! 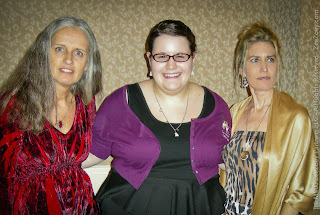 Another favorite part was meeting Deb Barnes of Zee & Zoey! 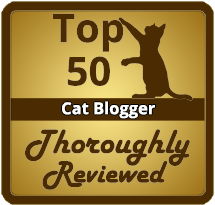 Ingrid won the Hart's Chewable Vitamins Award for her article on The Joys of Adopting an Older Cat. The conference was very useful, I made lots of new contacts and met so many amazing cat writers. A senior in high school could've never dreamed to go on such an amazing trip. Hi everyone! Tonight's post is really cool, because I have been given some awesome stuff by the Castor and Pollux Natural Petworks people to give away! Castor Pollux Pet is all about natural and organic pet products. The company started in 2000 and continues to succeed today. 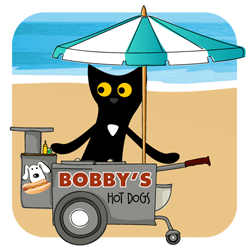 Their goal is to "provide pet parents with healthy, safe, and innovative choices for their dogs and cats." Castor and Pollux has provided me with 8 cans of their adult cat food and 2 organic cat nip toys and a big ol' bag of nip to go along! All of this could be yours if you win! To enter, please leave your email! 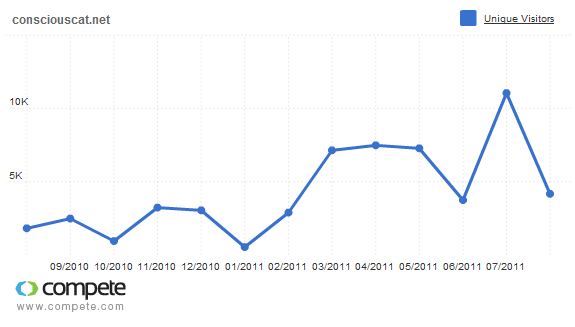 Contest runs from 11/8/11 to 11/22/11 EST. Winner will be picked at 8pm EST on 11/22/11! *Comments without email addresses will not be entered. Tired of boring old cat toys? 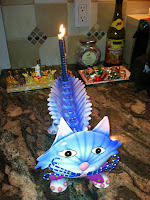 Want something eco-friendly and crinkly, that you know your cat will love? Then you need to buy Junk Food Flyers from Moderncat Studio! 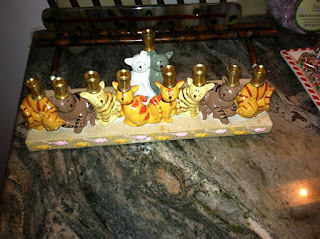 Created by Kate Benjamin and tested by her kitties! These flyers are made from "clean recycled cat food bags" as stated on a card included with Sandpiper Cat's Junk Food Flyers. Kate sent Sandpiper Cat two Junk Food Flyers to write a review...so from the head cat Piper and her assistant Sabrina, we bring to you, Sandpiper Cat Blog's review of Junk Food Flyers. Sabrina inspecting her new toy. Get a whiff of that! Deez krinkley crunchy toys are one of my new favorites. 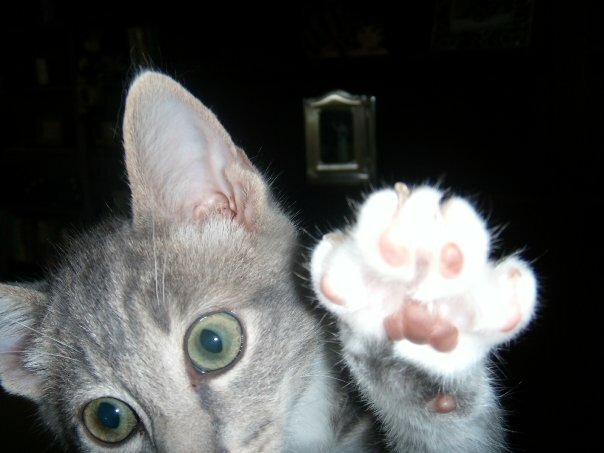 I liked to hold the crinkle in between my pawz. It even makes a good hat! 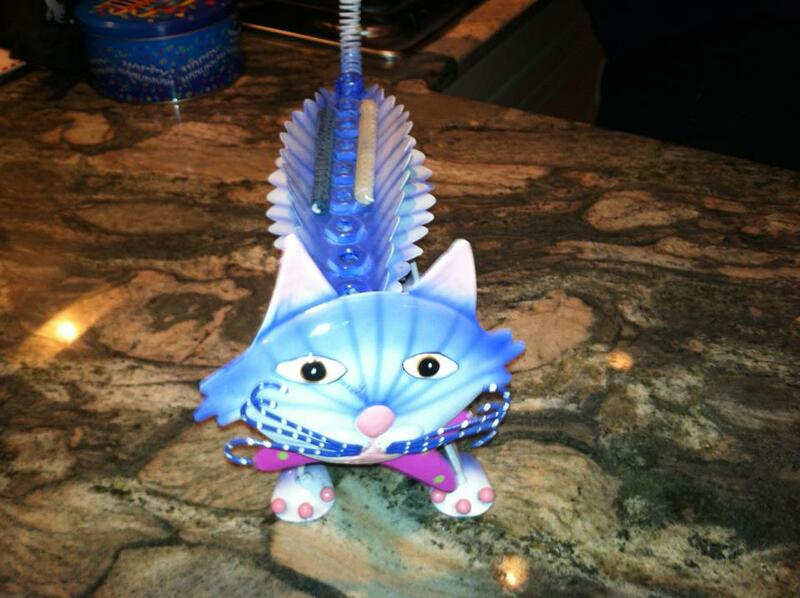 I think other kittiez would like these toyz because they are fun to chase! They try to runz away but I am so fast I can catch it! I have to share mine with Sabrina, but she likes to runz around with themz on the bed. The Junk Food Flyers can be purchased on Kate's Moderncat Studio Etsy shop. 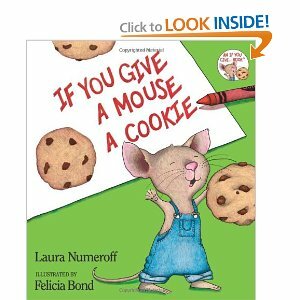 Junk Food Flyers can be purchased in a set of 5 for $5. Shipping is $2 in US, $2.50 Canada and $3 anywhere else. Junk Food Flyers will have your cats running around like crazy! These are worth purchasing! Visit Moderncat Studio at http://www.moderncat.net/. I have in no way been compensated for my review. 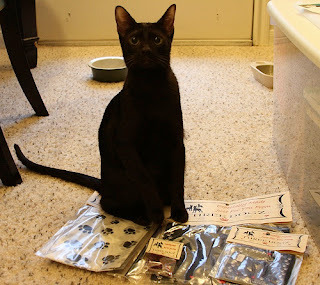 Moderncat Studio sent the toys to me to review for free. This review is solely my own opinion. help me win a Fb contest and like MY COMMENT on this picture towards the bottom https://www.facebook.com/#!/photo.php?fbid=10150316879878449&set=a.93328833448.77869.54316703448&type=1&theater Please make sure you like the comment, not the photo! Help us win a contest on Facebook! Simply go to this link, scroll down to the bottom and like the comments from Rachel Shubin and Sandpiper Cat Blog. Blogging isn't just a hobby for me. At least, it was until I went to the BlogPaws conference. I learned that with blogging you can do so much more than write for your friends and family. Expanding your blog by promoting it on Facebook, having business cards, sharing your link online as well as networking with fellow bloggers. After going to BlogPaws I came home without any of my business cards left, but plenty of cards with my new contacts. I subscribed to their blogs and read them as frequently as I can. I've been given free cat toys to review on my blog, which I haven't done yet because our cats have crazier lives than we do! I was recently contacted about a no more odor spray for cat litter smells, and will be getting a sample to review on my blog. I want to not only enjoy blogging for myself, but promote my blog to others and get on the radar. I'm not in it for glory, fame or freebies - but recognition that my writing has touched at least one person. I promote my blog by buisness cards and my Facebook page you can find here. I know that I have quite a few readers, and I hope to increase my following. Today's 31DBBB post is a list post. 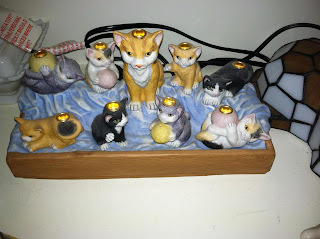 I will talk about ALL the cats I've had in my life, in a list post, with a short explanation. 1. Ashley - Ashley was a boy orange tabby, named for Gone With the Wind. 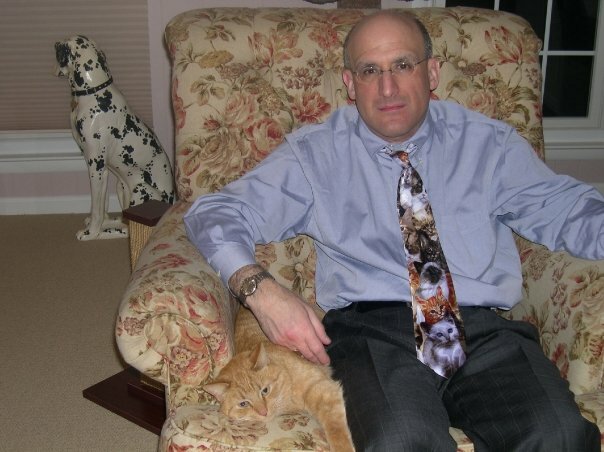 He was my dad's first cat, received from a friend whose cats had kittens. Formally named Barney, my dad made the change to Ashley. According to my dad, Ashley was a crazy kitten and the vet (at the time in the 1990's) suggested my dad have him front declawed. Back then, declawing was endorsed by vets - never realizing how truly painful it is to remove the claw and the joint of the cat. He was our one and only declawed cat, something we would never do again. Ashley was one of the unusual cases of cats who got an injection site sarcoma, which gave him cancer. He lived until he was 16 years old and died from sarcoma cancer in 2001, some time around 9/11. 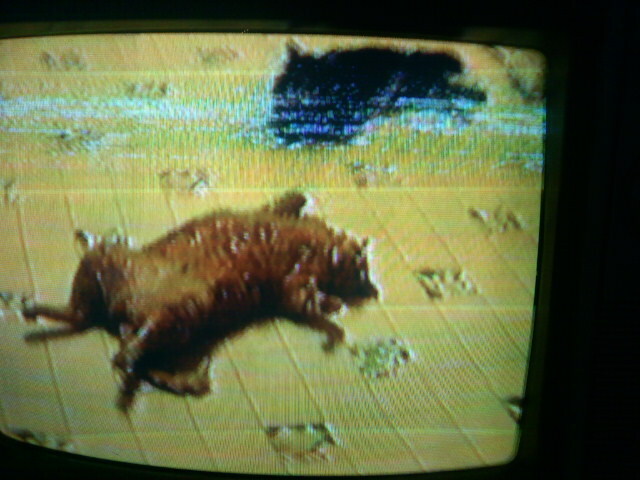 A blurry screen shot of Ashley (bottom) and Marsh (top) from a home video. 2. Marsh - Short for Marshall, - the supreme court judge- was my dad's second kitten he got to keep Ashely company. Marsh was actually a purebred Maine Coone that my dad bought from a breeder (who actually ended up being a hoarder). Marsh was our first and only purebred cat. 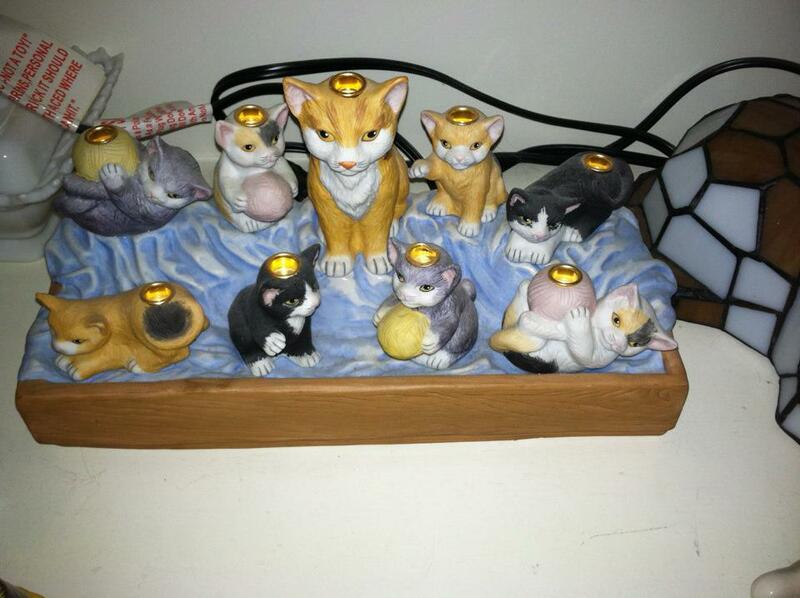 Another 1990's popular cat decision that we would never make again now. Marsh and Ashley didn't get along, and Marsh wasn't necessarily the sharpest crayon in the box. Marsh one time ate a brillo pad and went to the emergency vet. He ended up living through that and pooping out pieces of brillo pad for a while. Marsh got sick in mid 2005 and it is presumed it was some sort of cancer. Marsh passed in June 2005, a few weeks before we left for vacation. 3. Parker - After Marsh died, we decided to get kittens since my dad and mom were the only ones who've had them before. Parker was one of the first kittens we picked out from lostdog.org. He was a gray tabby and was 2 months old. The rest of Parker's litter, Piper, Paris and one other P kitten all had health problems. It turned out that it was FIP or Feline Infectious Peritonitis, which would claim Parker's life on December 27, 2005 at 8 months old. Parker was the sweetest little baby, and not a day goes by that I don't miss him dearly. I hope that one day a cure for FIP will be found. 4. May - aka as Maybelline, Moo, Moobelle, Anamariamadonnachristinamay (not a typo) and a few other goofy nicknames! She was a brown tabby we adopted from Lost Dog along with Parker. May and Parker loved each other and roughhousing around the house. May had very big ears as a kitten and we did not realize that she would grow into them. May became a big boned, 15 pound cat, currently 17 pounds as a result of taking steroids due to allergies. She prefers my mom over all people, and slinks when my dad pets her. 5. Esterbrooke - Mostly called Brooke, Cookie and occasionally "The Mad Hatter." Brooke is our first tortoiseshell kitten and she is as crazy as crazy comes. Parker and Brooke bonded instantly and became best buddies. They were always by each other's side. When Parker died, Brooke looked around the house for him, and that is how we knew we needed to adopt another cat. Today, Brooke is still as fiesty as ever. She likes to stalk Sabrina and Piper and does not get along with them very well. Of course, what else is to be expected of a tortoiseshell. 6. Victoria (foster failure) - More commonly called Vickie (or Vicki depending on how I like to spell it) is May's mother, but a very small 8 pound cat. Vickie was on the Lost Dog website for 3 months after we adopted May. We felt so bad, her picture was so solemn...she came home as a foster. Vickie hid behind the dry wall in our basement and we slid food bowls in and out for her before she finally came out. 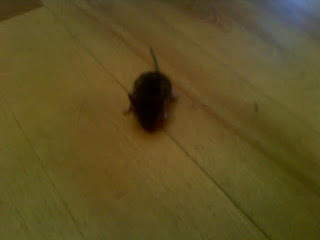 She came out for mom's beef stew, but continued to lurk in the basement for three months after we had her. We did end up keeping her. Vickie does not like May, we think because of the time that they were separated. Today Vickie is getting the rest of her teeth out due to bad gums. Sad, but this procedure will make her live longer. 7. Henry - After Parker passed away, we knew that we needed to find another cat when Brooke was grieving over Parker. We wanted to make sure we took the right cat. So on my birthday 12/30 (3 days after Parker died) we went to Lost Dog to look at a cat called Bobby (our Henry). My mom took him out of his carrier, he wrapped his paws around her neck and gave her a nose kiss. Needless to say, sweet Henry came home with us as an additonal birthday present. He is the reason we kept our next kitty Pearl. 8. Pearl (foster failure) - We received an email from our rescue saying that little Page was sick and needed a foster or she would die. Not giving the email a second thought, we took Page home. We nursed her back to health. On the first visit out of the bathroom where we had been keeping her, Henry took one look at her and hasn't left her side since. Pearl since we've had her, has gained quite a few pounds and is a little pudgey. Pearl, white cat, before she got to be fat. 9. Nick and Smokey (fosters/lost cats) - The S on our door knocker does not stand for our last name Shubin, but for Sucker! It seems like lost cats always seem to find their way to our door. Nick and Smokey, came at two separate times and both found a happy ending with someone who wasn't us! My dad was on a walk one day and a siamese looking cat followed him home. We had never seen him before in our neighborhood, which made us think that he could be a new neighbor's pet, or potentially lost. None of our neighbors knew him, but they had seen him around for quite a while. When we decided to do something about him, we found out from a neighbor that he took Smokey to the pound. UGH! The humanity of some people. 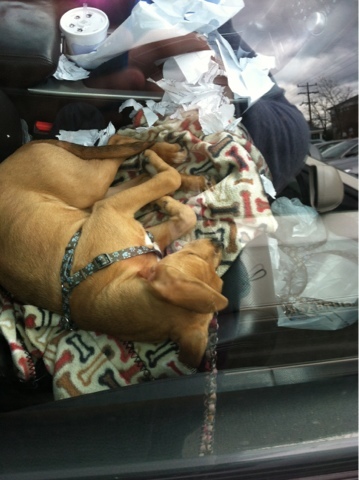 My dad and I put up flyers and he went to the pound. He told them it wasn't his cat, something we should've lied about to get Smokey. This was on a Friday. The volunteer at the shelter told my dad that she had seen signs in a neighborhood a few miles away from us, a missing cat for a chocolate point siamese. My dad and I went to the neighborhood and sure enough the description described Smokey. We called the lady but she said she really didn't think it was her cat, they had gotten a lot of calls already and basically given up hope. My dad sent the picture we had of him, and she called us crying saying that it was her cat. When the shelter opened on Tuesday, she picked Smokey up and we got to see him at their house. They were very greatful. Not many stories turn out that way. Dad and his buddy Nick. Nick is in the lower left corner, he blends in with the chair. Nick on the other hand, wasn't so lucky. He showed up in our neighborhood and our neighbors led him to our house. They knew we were involved with rescue and maybe we could help with this cat. We didn't know what to do, we just couldn't have another cat, so we got Nick - our naming of him Nicholas Valentino for Christmas and Valentine's day advertising, if he was still around by 2/14 - into the rescue. For a while we had him stay in the garage until one night he got out. We were on the way to temple and there was no way in heck I was letting him go at night. 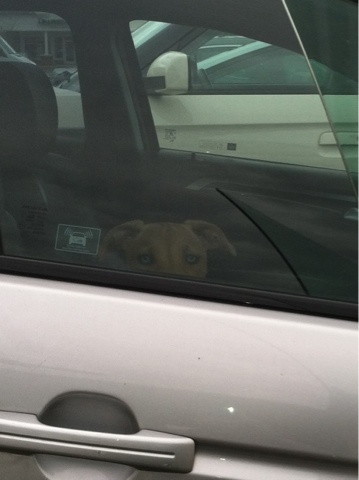 We were late, as I took the time to get him back into the garage. We decided after that to let him stay in a spare room in our basement. For a while Nick was allowed out about the house, but...Henry started pooping innapropriately after Nick took an interest in Henry's girlfriend Pearl. We knew that Nick couldn't stay. Shockingly, the night after the poop disaster, my dad got an email from a family interested in Nick. We had them over to see Nick and he hid behind our couch and growled. They took him anyway! A successful adoption, or a two week vacation for Nick, either way was good. The adoption stuck and we heard from them for a while...but we unfortunately lost contact. My dad is always said about Nick because Nick really loved my dad. He would mope around all day until dad got home. Dad would sit down in a chair, call "Nick" and he would come running from wherever he was in the house. Needless to say....Sabrina is now Dad's Nick. 10. Sabrina (foster failure) - Oh little Sabrina. 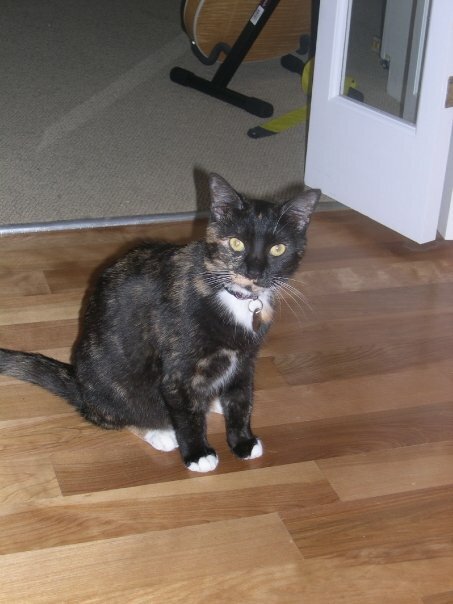 In 2009 during the course of three weeks adoption events, Dad (with me) convinced mom that we needed to foster little Sabrina. She was a black cat, like Henry. We had no intention of really "fostering her", it was just easier to say she was a foster than deny that we were planning on keeping her. Sabrina has a good life, but it is not ideal. She lives in my parents bedroom, with visits to other parts of the house often, because our cat Brooke cannot get along with her. Hopefully we will start medicating both of them, so we can work on having "open doors" as we like to say. 11. BeiBei (successful foster!) - BeiBei was our foster on a Friday night after an adoption event. We took her to just keep over the weekend until she could go out to Leesburg. Of course, she got so much attention on the Friday night at the adoption event. She was a Persian cat with a lion cut, wearing a sweater! It doesn't get cuter than that. A great couple spent a while talking with us. They weren't sure they could have a cat because they had four dogs. They called my dad on Saturday saying they wanted to adopt her. They filled out their adoption paperwork and officially adopted her. They came Sunday evening to pick BeiBei up. She was a sweetie, and the easiest foster we've ever had. The couple who adopted BeiBei, with her! 12. Gabby (successful foster!) - Although...Gabby and I really bonded. I really wanted to keep her. But we had heard that she didn't get along with other cats and she really didn't. She hissed at Henry...which was a definite sign that she wasn't going to work because NOBODY hisses at little innocent Henry. He's the welcome wagon! Gabby was also a Persian, but less so than BeiBei. She was a silver gray color and very sweet. She loved playing fetch with her little mouse and bringing it back over and over again. She always wanted me to play it at 2 am with her. She got adopted by my mom's friend, who has a bull dog. It's the smooshed face house family! Gabby and Lola (the bull dog) get along great and I haven't gone to visit her yet, but will soon. Gabby with her favorite mouse to fetch. 13. Piper (foster failure) - Well, you all know about Piper. Took her, same night she miscarried her kittens from 3-7 am in my bedroom. Nursed her back to health and she became bonded with me. She is the reason that my blog is Sandpiper Cat blog! Love my little girl, even if she sleeps with mom and dad. 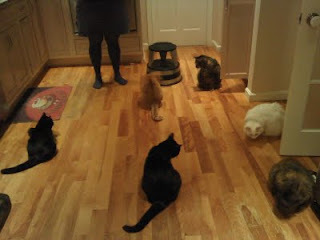 Evidence of having seven (oops, not yet) six cats. 14. Unmentioned others - There have been seven other kitties that have been in our lives, but only need a short posting. Molly, a calico and Samson, a black cat, both were adopted by our close family friends (two different friends, at two different times, but both from our rescue). They stayed at our house each for about a week before being brought to their permanent homes. They are both sweet and happy and we love hearing about them. Butch - a big male Tom, who spent most of his life unneutered so he ended up with a big head- got left by accident at an adoption event and was an overnight foster for us. He stayed in mom and dad's bathroom and was the sweetest thing. He ended up getting adopted by a nice man whose sister, I believe, wanted to steal him away from him! And the last four kitties were the sweet kittens we fostered this summer who were exposed to VS-Calici and had to be put down. RIP Abby, Frack, Lewis and Michelle. BYE!!!!! (Foster who I pet sat for).